(CNN) -- Colleagues and bloggers are praising a park ranger shot dead last week in Congo's Virunga National Park as a brave and committed protector of gorillas. Safari Kakule, a ranger at Virunga National Park, was killed Thursday in an attack by a militia, the park says. 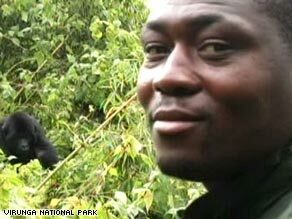 Federal and local authorities in the Democratic Republic of Congo continue to probe the death Thursday night of Safari Kakule, who was killed when Mai Mai rebels attacked a ranger station in the northern section of the park -- a refuge for rare gorillas. "We are deeply saddened by the loss," said Virunga National Park Director Emmanuel de Merode. In a tribute on a blog on the park's Web site, de Merode wrote, "Safari was an exceptional ranger" who had worked with gorillas for several years. "Recently he had trained as a para-vet, and he was expected to play a very important role in protecting the gorillas of Tshiaberimu," he said. Mount Tshiaberimu, in the northern part of the park, is home to an isolated population of 18 endangered eastern lowland gorillas. The group is distinct from the estimated 200 mountain gorillas in the southern region of the vast park, parts of which are controlled by Laurent Nkunda's Congolese rebel movement. Pierre Peron, a digital media producer for the park's Web site, said on the blog that the first time he saw gorillas was when Kakule guided him up Mount Tshiaberimu to see them. "[Kakule] was a gentle giant," Peron said. "He was intelligent, committed, and knew a lot about gorillas. During the couple days I spent with him, he marked me as someone who would go on to big things and have an important contribution to conservation in Virunga. He will be greatly missed." Mai Mai rebels are described as community-based militia groups frequently involved in banditry. Another ranger was wounded in the attack and a rebel was captured. That arrest has resulted in several leads in the investigation. "The Mai Mai are seeking to wear down the rangers because they don't want the park to exist. They want to cultivate and poach in the park," said Samantha Newport, communications director for the refuge. The work of the rangers in such a perilous atmosphere was lauded by people who posted their condolences on the blog. About 1,100 rangers protect the national parks of eastern Congo amid civil warfare and political instability. One blog entry said, "The willingness of Virunga's rangers to go out every day in the face of such danger is absolutely incredible." Talking about a Web site video showing Kakule with gorillas in May, the blog entry said, "The video, as sad as it is to watch, really makes one feel the gravity of the situation, and drives home the fact that Safari, and all the other rangers, are real people -- not just names. I am deeply grateful for all they do." Another blog entry said, "Safari was a selfless brave man and will truly be missed by all." Kakule, 33, is survived by his wife and three children.